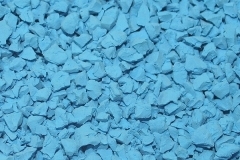 Opal EPDM (Ethylene-Propylene-Diene-Monomer) is a brightly coloured synthetic rubber which is granulated for use in wet pour rubber surfacing applications such as playgrounds. Opal EPDM rubber is cast into slabs then processed through a granulating and grading plant which sizes the product and removes the granulation dust under 0.5mm. Opal EPDM has characteristics of high elasticity and resilient performance. The pigments used in the Opal EPDM compound were selected to provide a wide range of colours. Results for accelerated UV resistance are available on request. UV Brights are a premium version with even more UV resistance for problem colours. Opal EPDM is available in 1-4mm and 0.5-1.5mm granule sizes. Copyright © 2019 Safety Surfaces. Powered by WordPress. Theme: Spacious by ThemeGrill.